This 80W LED Portable Work Light gives out 10400 lumens 360° of light, replacing up to 300W metal halide fixture, rated for 50,000 Hours operating lifespan. Plug-n-play instant operation with 10ft UL-Listed plug-in cord will provide temporary lighting power you need promptly. The rugged stainless steel protective guard, adds additional durability and protections to the product. 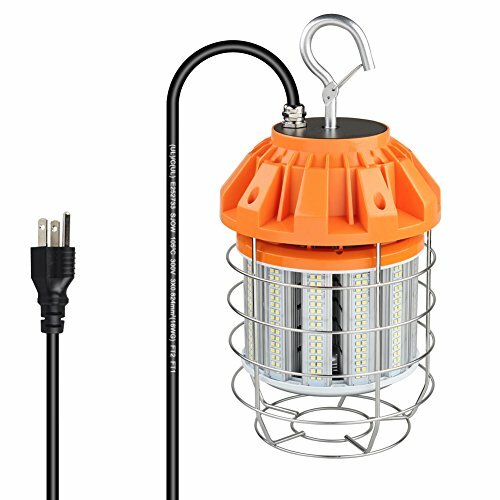 Our LED transportable jobsite Lighting fixture comes standard with a steel safety hook on the top for hanging from the ceiling, or just simply put it on the floor. A wide variety of mounting options and IP65 rated allow to use for indoor or outdoor lighting, such as construction, military, industrial and emergency services. On-the-Go: This Multi Functional LED Temporary Work Light is light weight with 10ft power cord that allow it for quick positioning and easy portability. And it requires no ballast, so the operator doesn't need to drag a bulky ballast housing around. INSTANT ON! Versatile: LED portable work light comes with a steel safety snap lock make it quick and easy to install or remove. You can hang it from the ceiling to maximize the area of illumination, or simply put it on the floor. Better Design: Heavy Duty and rugged construction with the heavy gauge steel safety guard can endure shocks, vibrations and rough handling without breaking the lights. Designed for better heat dissipation with unique aluminum Heat Sink. An integrated driver means you no longer have to spend more money on external ballasts. Rated over 50,000 hours of use(23years,based on 6 hrs/day). With no bulbs to break or replace, this portable light will always be ready to work for you. Outstanding Output: Our 80W LED Work Lights produces lumen output of up to 10400 using the newest energy efficient LED technology which brightly illuminate entire rooms and outdoor work areas with low-cost operation. Equivalent light output to a 300W metal halide work light. Certified: LED Portable Work Lights have been certified by UL that ensure better quality, safety and reliability. 5 Years Warranty.